“Die Wirtschaft ist das Schicksal” (the economy is our destiny) – this insight of Walter Rathenau, politician and industrialist, the white hope of the young Weimar Republic, murdered in 1922, is of disquieting topicality. For more than a decade, we have witnessed a veritable boom of European constitutionalism which sought to pave the way towards an ever closer and ever more democratic Union. These debates were intense. They were nevertheless characterised by a benign neglect of the constitutional dimensions of “the economic” and the failure to comprehend its political functions. There are, of course, exceptions. The authors of the “constitutional analysis of the Eurozone crisis” could build upon important pertinent preparatory work. My comments on their pathbreaking monograph will focus on the encounters of the German Constitutional Court and the CJEU with Europe’s economic constitution and its present crisis management. This focus on the jurisprudence reflects, on the one hand, the integration through law tradition and the prominent role of the ECJ therein. It is, by the same token, a reflection on the potential of constitutional adjudication in Europe’s state of emergency, in which a compound of executive and governmental power directs Europe’s affairs. Although the Tuoris deal with the CJEU and its recent Pringle case much more extensively than with the German court, I, nevertheless, will start with the latter. Its pertinent jurisprudence is not only richer, it was also often perceived as a sword of Damocles over the future of the common currency. 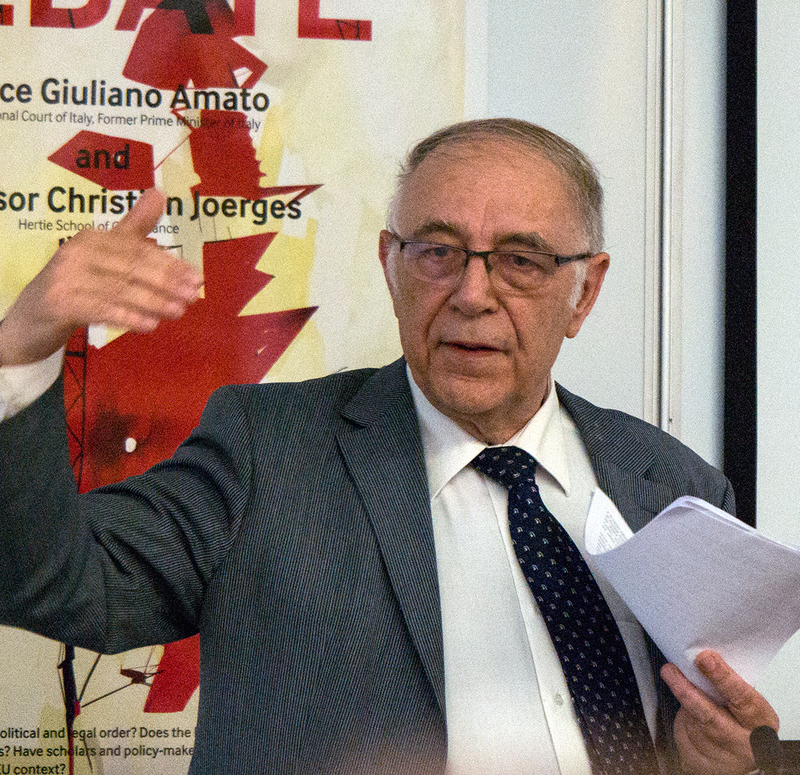 The most notable and, for this reason, also the most praiseworthy exception to the disregard of the economy in European law scholarship is German ordo-liberalism, which, from the foundational period of the integration project onwards, has assigned to the ensemble of economic freedoms in the EEC Treaty – in conjunction with its commitment to a “system of undistorted competition” – constitutional functions upon which the legitimacy of European law could be founded and which would, by the same token, de-limit its scope. A good number of observers of Germany’s present crisis politics have noted the impact of this tradition, albeit often all too superficially. The Tuoris provide both far better and far more thorough orientation. They capture the specifics of the ordo-liberal vision of the legal ordering of the economy very well, in particular, the synthesising of the economic and the legal ordo, which has little in common with the mainstream of law & economics and other varieties of neo-liberalism, such as that of the Chicago School. What they fail to address is the influence of von Hayek on the second generation of the school, which did not destroy the normative law-economics synthesis, but led to policy-reorientations of nothing less than paradigmatic proportions. This failure is, to some degree, compensated by their distinction between the micro-economic and the macro-economic constitution. Economic and Monetary Union (EMU), as established by the Treaty of Maastricht, with the new exclusive European competence for monetary policy, its anti-inflationary dedication to price stability, the establishment of an independent central bank far removed from all political influence and placed firmly outside the institutional structures of the Union – this ensemble could, indeed, be perceived as a new – “macroeconomic” – constitutional framework. National autonomy (and responsibility) for fiscal and economic policy seemed compatible with this framework because the no bail-out provision of Article 125(1) TFEU and the prohibition of central-bank financing (Article 123(1) TFEU) were expected to exercise a disciplining influence. Soft co-ordination of economic policy and soft supervision (Articles 121, 126 TFEU), together with the again soft Stability Pact of 1997 were supposed to complement this regime. Should one, indeed, can one, call this bundle of provisions and mechanisms a “constitution”? Clearly not, opined renowned exponents of the ordo-liberal tradition such as Manfred E. Streit, former Director of the Max Planck Institute of Economics. In their view, even the “micro-economic constitution” with the “system of undistorted competition” as its core had been distorted because the Treaty of Maastricht had assigned equal status to further and now competing objectives including industrial policy, to the effect that the relative weight of the competition mechanism was to be determined in political processes. Adding insult to injury, President Sarkozy later saw to it that the “system of undistorted competition” was moved from its prominent place in Article 3(g) of the Maastricht Treaty to Protocol No 27 of the TFEU. More importantly, how the obviously fragile new macro-economic regime would compensate this erosion is unclear. In the ordoliberal tradition, the “interdependence” of both regimes would have to be conceptually clarified and legally ensured; the pluralistic juxtaposition of two constitutions which the Tuoris identifywould have been perceived as a miserable comforter. As the case for an economic constitution, macro-and/or micro-, seemed to be already lost, the German Constitutional Court stepped in with its judgment of 12 October 1993 on the Treaty of Maastricht which was to become a landmark decision. The judgment was widely discussed and criticised for its apparent scepticism towards established doctrines of European law, a misplaced reference to Weimar’s famous constitutional theorist Hermann Heller, an icon of the left in Germany, and the defence of Germany’s statehood. Hardly anybody paid due attention to the passages on Monetary Union. They were, however, simply amazing and remain particularly noteworthy in the present context: the economic constitution with its substantive and institutional substitution of politics and policies by legal rules was, according to the Court’s reasoning, nothing less than a sine qua non for German participation within Monetary Union. This assertion was the Court’s response to the argument that the European Union was about to acquire such wide-ranging competences that the Member States could no longer act as the masters of their “democratic statehood”. Economic integration was, in the Court’s view, an autonomous and apolitical process, which might, and indeed must, take place beyond the reach of Member State political influence. By virtue of the constitutionalised commitment to price stability and rules that guarded against inappropriate budgetary deficits, Monetary Union was correctly structured. Accordingly, all doubts about the democratic legitimacy of economic integration were diverted. To rephrase the argument slightly: yes, the Treaty is compatible with the Basic Law. But this is true only because it is inspired by Germany’s stability philosophy and only as long as this stability commitment is actually respected. The Tuoris discuss this judgment in Chapter 8 and underline its weight as a precedent for the case-law that followed: the Federal Constitutional Court has indeed repeated the messages on the legal importance of the commitment to the stability philosophy in the judgment of 7 September 2011 on the aid measures for Greece and the euro rescue package, and again in the decision of 12 September 2012 rejecting an application for a temporary injunction to prevent the ratification of the ESM Treaty and the Fiscal Compact. These commitments to the ordo-liberal legacy, however, were never to be taken too literally. Former Constitutional Judge Ernst-Wolfgang Böckenförde, in a widely-noted article in the Neue Züricher Zeitung of 21 June 2010, recalled with some emphasis a passage from the Maastricht judgment, from which one can infer that the 2nd Senate was fully aware of the fragility of the new “macroeconomic constitution”. The responsibility for its functioning, however, the judges in Maastricht had added, was one “for which the institutions with competence on the matter must take political responsibility”.. One remains perplexed. The judges knew very well that it would be impossible for the German government to politically correct the deal to which they had given their blessing. That German consent to the EMU was de facto irrevocable and “a fresh political decision” on how to proceed further was inconceivable. The subsequent decisions display very similar patterns. The commitment to the ordo-liberal economic constitution was strong only on paper. Political practice, and economic and fiscal policy could operate opportunistically. The development of new modes of economic governance in the course of Europe’s crisis management profoundly transformed the constitutional constellation of the Union and have affected even more visibly what was still left of the ordo-liberal constitutional legacy. It was the CJEU’s Pringle judgement, handed down on 27 November 2012, that pronounced this change very clearly. Europe’s new economic governance, so the Court explained, was no longer committed to a “system of undistorted competition”, which would place its trust in the “discovery procedure of competition”. Its new vocation has instead become one of safeguarding “the financial stability of the euro area as a whole”; the governmental and regulatory means which seek to serve this end are so-to-speak “legal per se.” Thereafter, the Federal Constitutional Court in its spectacular judgment of 14 January 2014 for the first time in its history made use of the reference procedure. The arguments of the Court questioning the legality of the Outright Monetary Transactions (OMT) programme of the ECB seem to rely strongly on the ordnungspolitical reservations against any bail-out and state financing as articulated by the President of the Bundesbank Jens Weidmann. One must not read the OMT judgment with its objections against the OMT programme in isolation, however. This judgment was preceded by the preliminary injunction decision of 12 September 2012 and followed by the definite settlement of that causa in the judgment of 18 March 2014. Both of these decisions evidence the readiness to subscribe fully to the logic of the Pringle judgment. This logic is characterised by the means-ends-rationality of assumed functional necessities. It does not apply rules, but resorts to differentiated and situational managerialism. The irony of this move is that it occurs in the name of democracy. As the Federal Constitutional Court underlines, the Bundestag must remain the institution which specifies the limits and the conditions of Germany’s financial contributions to the ESM. The Bundestag is, of course, a democratically-legitimated and politically-accountable institution par excellence. However, it derives its legitimacy from Germany’s citizens alone, and this mandate does not justify an encroachment into the political affairs of other democracies. Quite to the contrary, we should expect Germany’s courts and also its political institutions to respect those of the other Member States of the Union. Yet, encroachments occur through the dependence of financial support on “strict conditionality” as spelled out in great detail in the “Memoranda of Understanding” to be approved by the receiving state. “Understanding” here is a euphemistic notion. As Michelle Everson has recently observed, conditionality irrevocably undermines “the status of the Member States as ‘Masters of the Treaties’ … Just as the Federal Government within Germany respects the democratic integrity of the länder which make up the federal state, the Federal Republic of Germany cannot, in its relations within the European Union, contract with ‘slaves’. It cannot enter into partnership with anything other than fully sovereign states”. Damian Chalmers has addressed the same phenomenon expressing similar concerns: “The associative ties“ as they are now established in the Eurozone, he argues, “are not concerned with securing mutual recognition of citizens or of realising common purposes. They are to secure order and the survival of the system: a European raison d’état in which the latter becomes not simply a value in itself but possibly the highest value“. Europe is experiencing a Schmittian, rather than a constitutional, moment. II. “Brother can you paradigm?” And how about Your Commitment to Democracy and the Rule of Law? The last mentioned problématique of “a largely unfettered power of rule to realise the governmental objectives it sets itself” (Chalmers) lies at the core of the Pringle case, which the Tuoris discuss extensively and interestingly. My observations will be restricted to three points: (1) the theoretical background of conditionality; (2) the dilemmas of legal interpretation, the need for its conceptual backing, and the emptiness of the European Court’s message; and (3) the constitutional vocation of the European judiciary. The first point concerns the legitimacy basis of conditionality which has been legalised through the new Article 136(3) TFEU. This basis is thoroughly discussed in Chapter 7 of The European Crisis. The Tuoris subscribe to the so-called argument from external effects in the version which was prominently defended by Miguel Poiares Maduro in his pleas for ‘A New Governance for the European Union and the Euro’. “The origin of the crisis”, so the argument goes, “can be found in the democratic failures of some states and the externalities they imposed on others but also in the incapacity of national democracies to control excessive cross-border capital flows.” To rephrase this intuition: under the impact of Europeanisation, our societies are experiencing an ever-greater gulf between decision-making in and by individual polities and the impact of the resulting decisions on their neighbours. This schism is a normative challenge to democratic orders because the very notion of democratic self-legislation requires that citizens who are the addressees of a law and affected by them can, in the last instance, interpret themselves as its authors. I readily admit that I have defended this argument ever since the mid-1990s: European law has the potential and the vocation to compensate the structural democratic deficits of nation-statehood. Here lies its inherently democratic potential and legitimacy, which is categorically different from that of nation states. These affinities notwithstanding, I find Maduro’s version of the argument, and hence also the apparent, albeit not whole-hearted, consent of the Tuoris, deeply flawed and agree with Alexander Somek’s critique of “the darling dogma of bourgeois Europeanists”. To identify structural democracy deficits in the external impact of national policies and laws does, by no means, justify a correction of such practices by a supranational executive compound. Such corrections must, instead, remain compatible with Europe’s commitments to democracy and the rule of law. The judgment of the CJEU in Pringle is, in conjunction with the amendment of Article 136 TFEU, characterised as a transformative act, and the Tuoris are prepared to defer “to the weight the speech acts of the constitutional legislator and the constitutional court (ECJ) have in EU constitutional discourse” (p. 119). Yet, they also feel free to criticise important elements of these transformations, including the rescue actions undertaken by the ECB through which “the ECB has risked attaining a stakeholder position vis-à-vis the banking sector, which may cause complications for its role as an independent monetary expert” (p. 226). This contradictory reasoning is deplorable and deserves the critique to which Michelle Everson has recently exposed it in her plea for legal honesty. Fortunately enough, the Tuoris are, in their argumentation, more cautious and more sophisticated than the CJEU. In their re-construction of the Maastricht provisions on EMU and of the purpose and telos of the bail-out prohibition, they build upon their insights into the ordo-liberal legacy and on this basis set out the conceptual basis and economic philosophy of the no-bailout clause which was meant to discipline national politics. This re-construction is fully in line with the current state of Ordnungsökonomik, as Lars Feld, the President of the Walter Eucken Institute in Freiburg and, according to a ranking in the Frankfurter Allgemeine Zeitung, Germany’s most influential economist has recently re-stated it. Feld, however, does not subscribe to the step taken by the Court in Pringle, namely, to replace the telos of Ordnungsökonomik by the higher objective of “maintaining the financial stability of the monetary union”. He does not take this step because he does not believe in its rationality. At this point, the position taken by the Tuoris in The Eurozone Crisis seems somewhat ambiguous: the two-level teleology is first understood and acknowledged as a harmonisation of the objective of disciplining Member States with “crisis resolution, which may require measures deviating from this prohibition”. Then, the authors warn that an improper use of this freedom might have destructive effects and suggest a precautionary measure: the potential contradiction is to be solved via “strict conditionality” (pp. 127-130). It is again apparent from this argumentation that the Tuoris have moved beyond the Freiburg tradition. The type of “harmonisation” which they suggest is irreconcilable with the function of ordo in that tradition. What the Tuoris defend is an operation that cannot be guided by legal rules but must resort to discretionary managerialism. To be sure, the ordo-liberals of the first generation, in particular Walter Eucken himself, did believe in an “economic science” which would be able to deliver conclusive answers to the queries of decision-makers. It is this belief in expertise upon which their quest for the establishment of independent bodies with decision-making powers was based. “Science” as Eucken understood it is meant to provide a shield against political discretion. That shield, however, has then been taken away by Friedrich A. von Hayek who unsettled the institutional basis of traditional ordo-liberalism profoundly. Following his conceptualisation of competition as a “discovery procedure”, the lawyers of the second generation of ordo-liberals revised the “system of undistorted competition” accordingly. Furthermore, von Hayek explained, in his seminal Nobel Prize acceptance lecture in 1974, that the kind of expertise which policy-makers tend to invoke is nothing better than a mere “pretence of knowledge”. I have spent a good deal of my academic life criticising both generations of ordo-liberals. But this, of course, is not to say that their arguments do not deserve to be taken seriously. A diagnosis which seems to captures the problématique of Europe’s crisis management more comprehensively and adequately has been provided by Colin Crouch in his prize-winning deliberations on The Strange Non-Death of Neoliberalism. According to this diagnosis, the failure of the EMU cannot exclusively be attributed to flaws in its institutional design. It is, instead, also indicative of a crisis of the neo-liberal philosophy which has inspired it. But this paradigm has not been replaced to date. “Brother can you paradigm?” is the challenging question which Harvard Professor Peter Hall has raised. Not in the near future, he explained. If there is a kernel of truth in these observations, we have to be cautious with polemics against those who act under irresolvable uncertainties – as long as they do not operate under false pretences. We should, however, be equally cautious with the disregard of our commitments to democratic principles and the rule of law. This price may be unreasonably high. Europe’s constitutional courts find themselves in a very uncomfortable situation. They are confronted with problems for which no reliable theoretical answers are available. They not only lack conceptual, but also democratically legitimated, guidance. There are, in my view, two lessons for lawyers to learn from such observations. The first is that we must neither be surprised by the takeover by crisis managers and their practices of muddling through, nor arrogant in our evaluation of all this. But it does not follow that we should endorse a judicial deferral to the praxis of Europe’s crisis management. In the recent OMT judgment of the Federal Constitutional Court, two dissenting judges expressed their uneasiness with the quest for decisions on issues which are undecidable under standards of law. According to Judge Lübbe-Wolff, the complaints should have been rejected as inadmissible. Judge Gerhardt argued that the Court should not step into the way of political decision-making where the political actors could have voiced political opposition. The two dissenters may have gone a step too far. The law’s state of emergency has been generated by a legal framework which constrained policy-making by democratically-legitimated institutions illegitimately and dysfunctionally. Judicial constraint could go hand in hand with the search for a re-configuration of this misconceived law-politics relationship which would enable and encourage the return to a constitutional condition. What we all have to become aware of are the uncertainties and contingencies under which we have to move ahead. This is anything but a revolutionary insight. The risks inherent in market economies are not categorically different from so many others which modern societies have to cope with. This acknowledgement could protect us from the tragic choice in which The Eurozone Crisis entangles us, the choice between de-politicised technocratic rule, on the one hand, and the establishment of democratic federalist structures, on the other (p. 213). Since we cannot expect that the normatively attractive alternative will come about through some democratic Urknall, we would indeed have to conclude with the authors: “In sum, we are not very optimistic” (p. 266).“Die Wirtschaft ist das Schicksal” (the economy is our destiny) – this insight of Walter Rathenau, politician and industrialist, the white hope of the young Weimar Republic, murdered in 1922, is of disquieting topicality. For more than a decade, we have witnessed a veritable boom of European constitutionalism which sought to pave the way towards an ever closer and ever more democratic Union. These debates were intense. They were nevertheless characterised by a benign neglect of the constitutional dimensions of “the economic” and the failure to comprehend its political functions. There are, of course, exceptions. The authors of the “constitutional analysis of the Eurozone crisis” could build upon important pertinent preparatory work. My comments on their pathbreaking monograph will focus on the encounters of the German Constitutional Court and the CJEU with Europe’s economic constitution and its present crisis management. This focus on the jurisprudence reflects, on the one hand, the integration through law tradition and the prominent role of the ECJ therein. It is, by the same token, a reflection on the potential of constitutional adjudication in Europe’s state of emergency, in which a compound of executive and governmental power directs Europe’s affairs. Although the Tuoris deal with the CJEU and its recent Pringle case much more extensively than with the German court, I, nevertheless, will start with the latter. Its pertinent jurisprudence is not only richer, it was also often perceived as a sword of Damocles over the future of the common currency. These commitments to the ordo-liberal legacy, however, were never to be taken too literally. Former Constitutional Judge Ernst-Wolfgang Böckenförde, in a widely-noted article in the Neue Züricher Zeitung of 21 June 2010, recalled with some emphasis a passage from the Maastricht judgment, from which one can infer that the 2nd Senate was fully aware of the fragility of the new “macroeconomic constitution”. The responsibility for its functioning, however, the judges in Maastricht had added, was one “for which the institutions with competence on the matter must take political responsibility”. One remains perplexed. The judges knew very well that it would be impossible for the German government to politically correct the deal to which they had given their blessing. That German consent to the EMU was de facto irrevocable and “a fresh political decision” on how to proceed further was inconceivable. The subsequent decisions display very similar patterns. The commitment to the ordo-liberal economic constitution was strong only on paper. Political practice, and economic and fiscal policy could operate opportunistically. A diagnosis which seems to captures the problématique of Europe’s crisis management more comprehensively and adequately has been provided by Colin Crouch in his prize-winning deliberations on The Strange Non-Death of Neoliberalism. According to this diagnosis, the failure of the EMU cannot exclusively be attributed to flaws in its institutional design. It is, instead, also indicative of a crisis of the neo-liberal philosophy which has inspired it. But this paradigm has not been replaced to date. “Brother can you paradigm?” is the challenging question which MIT Professor Peter Hall has raised. Not in the near future, he explained. If there is a kernel of truth in these observations, we have to be cautious with polemics against those who act under irresolvable uncertainties – as long as they do not operate under false pretences. We should, however, be equally cautious with the disregard of our commitments to democratic principles and the rule of law. This price may be unreasonably high. Europe’s constitutional courts find themselves in a very uncomfortable situation. They are confronted with problems for which no reliable theoretical answers are available. They not only lack conceptual, but also democratically legitimated, guidance. There are, in my view, two lessons for lawyers to learn from such observations. The first is that we must neither be surprised by the takeover by crisis managers and their practices of muddling through, nor arrogant in our evaluation of all this. But it does not follow that we should endorse a judicial deferral to the praxis of Europe’s crisis management. In the recent OMT judgment of the Federal Constitutional Court, two dissenting judges expressed their uneasiness with the quest for decisions on issues which are undecidable under standards of law. According to Judge Lübbe-Wolff, the complaints should have been rejected as inadmissible. Judge Gerhardt argued that the Court should not step into the way of political decision-making where the political actors could have voiced political opposition. The two dissenters may have gone a step too far. The law’s state of emergency has been generated by a legal framework which constrained policy-making by democratically-legitimated institutions illegitimately and dysfunctionally. Judicial constraint could go hand in hand with the search for a re-configuration of this misconceived law-politics relationship which would enable and encourage the return to a constitutional condition. What we all have to become aware of are the uncertainties and contingencies under which we have to move ahead. This is anything but a revolutionary insight. The risks inherent in market economies are not categorically different from so many others which modern societies have to cope with. This acknowledgement could protect us from the tragic choice in which The Eurozone Crisis entangles us, the choice between de-politicised technocratic rule, on the one hand, and the establishment of democratic federalist structures, on the other (p. 213). Since we cannot expect that the normatively attractive alternative will come about through some democratic Urknall, we would indeed have to conclude with the authors: “In sum, we are not very optimistic” (p. 266). SUGGESTED CITATION Joerges, Christian: Where the Law Ends, VerfBlog, 2014/4/12, https://verfassungsblog.de/where-the-law-ends/.